Want a bed, and company, that works to suit you and your needs? Eco Terra is proud of their hybrid bed that is designed to suit most sleep preferences. The company is dedicated to listening, and responding, to consumer feedback to ensure shoppers are truly satisfied with their new bed. Our overview of the Eco Terra will explore the construction of this product and will give suggestions as to who it should work best for. You’ll find scores based on quality, support, and other top priorities for mattress buyers. Keep scrolling to read our comprehensive review to learn all the ins and outs of this mattress, or skip to the end for the final overview and scores. Want a classic hybrid experience – The upper latex layer should provide soothing pressure relief and a body-hugging contour. Shoppers should also experience sturdy support once the coils become activated. Prefer more natural materials – The cover features certified organic cotton, along with a natural wool fire barrier. The latex itself is certified to have low levels of additives or chemicals. Need temperature regulation – The airy nature of the Talalay latex, combined with the individually pocketed coils, should promote airflow. The wool inside the cover should promote temperature regulation, further reducing the possibility of overheating. Prefer a classic memory foam feel – The materials in this mattress should have more bounce and spring than a classic memory foam bed. Sleepers should still be able to enjoy pressure relief and contouring. Eco Terra is a latex and coil hybrid, bed-in-a-box product. The mattress can be used on any solid surface, including adjustable frames, slatted bases, or the floor. The cover boasts certified organic cotton and a wool fire barrier that should promote temperature regulation. This mattress stands 11 inches in height. The first layer holds 3 inches of Talalay Latex. This material should be responsive and should offer soothing pressure relief. The base layer consists of 8-inch Supportive Fabric-Encased Steel Coils. This coil system features individually wrapped coils to help reduce motion transfer. The springs should compress or pushback depending on your body weight. The perimeter promotes enhanced edge support due to slightly stronger Steel Coils running around the edges of the bed. The medium version of this bed features a score of 5.5 on our comfort scale. This scale implies that a score of 1 is feather soft and a score of 10 is rock firm. Eco Terra’s 5.5 score should provide a medium feel for most shoppers. The company also offers a medium-firm version, which ranks at a 7-8 on our scale. This should feel medium-firm to firm to most sleepers. When you lie on the cover, you should notice a plush, soft, and temperature-neutral feel. The coils should compress under more concentrated areas, like the hips and shoulders, allowing for deeper sinkage in these areas. 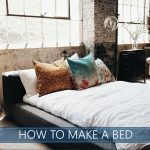 Areas that put less pressure on the bed, like the head and feet, should float on top of this mattress as the coils should stand firm beneath these body parts. The upper comfort layer should provide a contouring affect that promotes pressure relief. Shoppers should notice solid bounce from the coil system while the latex should respond quickly. This should allow combination sleepers to reposition freely. Most side sleepers should enjoy adequate pressure relief from the individually pocketed coils as they compress beneath their weight. The upper latex material should provide a plush feel that suits this type of sleeper. Stomach sleepers may require a firm level of pushback to prevent too much sinkage in the hips, especially if they are significantly heavier than average. The medium-firm version should work well for these shoppers. Back sleepers may choose between the medium option or the medium-firm, depending on their needs. If sinkage is a concern, the firmer option should promote even weight distribution and should prevent the coils from compressing too much under the hips. The contouring nature of the latex should provide ample lumbar support. There is no specific weight limit for this product. The coils inside this hybrid should support most shoppers, but if you have significantly higher weight concerns, the medium-firm model’s enhanced support should work well. The coils and latex should provide some spring and bounce to this product. However, the plush cover and fabric wrapped around the coils should help to absorb movement, helping to reduce motion transfer. Co-sleepers should be able to rest easy without worrying about their partner’s restless movements, though an all-foam product may be better for exceptionally light sleepers. This mattress utilizes steel springs around its borders to promote enhanced edge support. Buyers should notice a solid, consistent level of support all the way across the mattress when lying down. The medium-firm version should provide enhanced stability that should allow shoppers to sit on the edge with less compression than the standard medium option. Multiple Comfort Options – This bed is available in medium and medium-firm comfort feels. Trial Period – Eco Terra offers a trial period of 90 days. Warranty – The company offers a 15-year limited warranty. Shipping – This item ships free in the United States. OEKO-TEX® Certified – This product is certified to contain low VOC emissions and is safe for use by children under 3 years old. GOTS Certified – The cotton used in the cover is a certified organic material. Sleepers seeking a mix of pushback and pressure relief should enjoy this eco-friendly hybrid mattress. Two different comfort options should allow shoppers of all position preferences to find a feel that works for them. If you are in the market for a versatile hybrid, this bed’s mix of pressure relief and support, along with its bounce and easy repositioning should land this item on your must-have list. Two comfort versions allow different sleep types to choose the model that suits their preferences. Good motion control and enhanced edge support should make this bed a great option for couples.